I get asked all the time how I manage everything that I do with social media and blogging and the best answer for that is time management. What people want to hear is that there’s one magic button that you can hit to fast track your to-do list and be successful but there’s not. This month for My Book Club, I read I Know How She Does It: How Successful Women Make the Most of Their Time by Laura Vanderkam and loved learning about her research based on time logs of 1,001 days of women who make at least $100,000 per year. 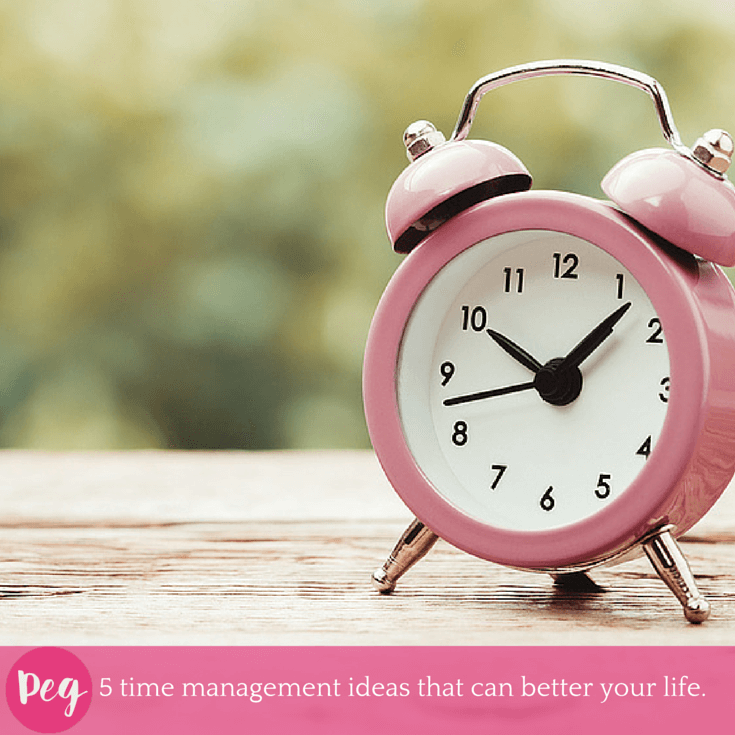 Laura shares her time management tips from this research as well as her own experience as a working mother with four small children who also happens to have run marathon and has written several books. Sounds like Laura can give us some insight indeed! 1. Try a time log to see how you’re spending your time. Vs. how you THINK you’re spending your time. Laura found that the 90% people who tracked time logs slept an average of seven to nine hours per night. Not too shabby! Finding where you’re spending your time can help you figure out how you can rearrange things to make more time for the things that you want to get done. 2. Get creative about what qualifies as family time. Stop beating yourself up if your family time doesn’t look like the Joneses. If trying to get the whole family together for dinner doesn’t work, start planning family breakfast together. Take advantage of the time that will fit into the master plan. Making things work is the most important thing – comparing your life to other people’s lives can lead to negative feelings. Mentoring another can lead to great rewards for both parties. Taking the time, even in small chunks, to help other people grow professionally can have long term benefits. You can enrich your field by helping others learn and advance. Today’s new hire could be a valuable ally down the road on a big project or might be able to help solve a problem that your next team faces. Investing in people by taking the time to network and spend time together is a worthy investment. 4. Plan your next week on Friday afternoon. Before you shutdown your business brain for the week, take the time to plan ahead for the following week while projects are still fresh in your mind. Your weekend will be a lot less stressful when you have the next week organized in advance. 5. Nurture the soft side of your career. From Laura, “I know when I go places, I find fascinating things to write about. I find stories that make me want to keep putting my foot on the gas with my career just so that I’ll have the opportunity to tell these stories to as big an audience as possible.” Getting out into the world and meeting people for coffee, attending conferences to network with leaders in your industry and peers that you can share stories with can help inspire you and motivate you to do better. There’s no prize for zero inbox or the most hours clocked at your screen. I hope you’ll look at a few ways that you can plan to make things happen and rework the things that aren’t working now. I Know How She Does It shares how other women have designed beautiful lives for themselves with time for family, work, personal time, and all the other things that make up the pieces of a full schedule. I’ve found in my career and life that you can make things happen if you work towards a goal and have a plan. Are you ready to get started with yours? Enjoy the video from my interview with Laura and the full transcript below. Peg Fitzpatrick: Hi internet, it’s Peg Fitzpatrick, and I am here today with My Book Club and I’m very excited to talk to Laura Vanderkam about her book I Know How She Does It: How Successful Women Make the Most of Their Time. Laura is a time management expert and she is a fellow Penguin author. This Book Club is in partnership with Portfolio Penguin who’s an amazing book publisher, if you don’t know them. Laura and I both love … I’m sure Laura loves them. I haven’t asked her that but I’m assuming she does. Laura, do you love them? Peg Fitzpatrick: Welcome, Laura, to My Book Club. Laura Vanderkam: Thank you for having me. Peg Fitzpatrick: We had a few little tech glitches with the internet, but that’s okay. I wanted to start with talking about how “Having it all syndrome” is kind of plaguing everybody because we’re all online, everybody’s perfect lives on Facebook and there are amazing dinners on Instagram, we’re seeing everybody’s highlight reels all the time and not that really what people’s real lives are like, so I thought maybe you could start by talking about how you manage at all because you’re a wife, you have 4 kids, and you’ve written books, and are you a marathon runner, did I read that? Laura Vanderkam: I have. I have run a marathon. Peg Fitzpatrick: That’s amazing. Maybe you could share a little bit about how you started this and why you wrote this book. Laura Vanderkam: I wrote this book partly because I think a lot of the literature about women and work and life is very negative. We have a tendency to focus on the stressful moments, the times when work and family are in conflict, we’re not sure what to do, the moments where life feels unsustainable, and everyone has that. I have 4 kids, I work, my husband works, there’s moments when everything’s a little bit out of filter, but in general, you can have bad moments within a very good life, and I think it’s important to look at the whole of life, the whole mosaic as opposed to the individual tiles. That was what this book was about. It was both to advocate looking at the big picture but also to show pretty intensely how successful women really spend their time, and so I went and collected data, time diary data, on a thousand and one days in the lives of women who both earn 6 figures and also have kids at home. By at least one definition, have it all, and see what their lives really look like, and the good news is that their lives are a lot more balanced than I think most of us thought they would be. Laura Vanderkam: It’s funny that you say that because yes, nobody ever overestimates how much they eat, and it’s the same thing with keeping track of time. In general, we have a very human tendency to believe that we work more hours than we actually do, we believe that we sleep less than we actually do, we think we have less leisure time than we actually do, and all of that makes sense. Just because of the way you experience, we naturally think we spend more time on things that we don’t want to be doing than things we do want to be doing, but when you look at the whole picture, you can take these things in context. Laura Vanderkam: I suspected I might see something along these lines but I don’t think many other people would have which is that they got reasonable amount of sleep. We assume that if you have a big job, you’ll have no personal life and if you somehow managed to have a personal, you will never sleep, but it turned out that the women in my studies slept 54 hours per week on average, which you do the math with 7 days in a week, that comes out to just a little bit under 8 hours per day. Laura Vanderkam: It’s pretty impressive. I knew from looking at some other large scale time diary studies that it was quite likely that people would generally be sleeping close to 8 hours because that’s more biological than a function of how important you are, but nobody thinks that way. Nobody thinks we get a reasonable amount of sleep so we remember the worst nights and tell stories about this. Peg Fitzpatrick: Right, our fishing stories, our fishing stories of parenting. Laura Vanderkam: You never tell the story about like “Yeah, actually, last night, I was in bed at 10:30 and got out of bed around 6-6:30, so that was 7 and a half hours, that’s good.” You don’t tell that story, that story is boring. You want to tell the story about how the baby was up 3 times and then you had to get on a 6AM flight or whatever it is, that’s far more entertaining. Peg Fitzpatrick: I have to admit, I totally went to bed at 10:30 last night and I slept until like 7:15. Laura Vanderkam: Yes, that sounds awesome. Celebrate that. Peg Fitzpatrick: I do. I don’t have little kids anymore so that does make it easier but the teen years and when they’re older, still it’s not as … They’re not babies waking you up but there’s different things that keep you. Laura Vanderkam: That are keeping you up late, probably. Laura Vanderkam: No, of course not. Peg Fitzpatrick: I loved your advice to plan adventures. Can you tell us about your list of 100 dreams and what that is and how people can use that? Laura Vanderkam: Yeah. This was an exercise that I got from a career pitch a couple of years ago. People want to have a better life and the first thing they often focus on is what they want to spend less time doing, and that’s fine but I think that’s somewhat less hopeful than focusing on what you do want to spend time doing because when you spend lots of time on the fun stuff, other stuff naturally takes less time. This exercise involves making a unedited list of anything you want to do or have more of in your life, so it can be travel goals, hopefully some professional goals, random things you’d like to do on the weekend, any of that, and try and keep going all the way to 100 because the first third’s pretty easy. People are like “I’d like to go to Italy.” We can do that for a while, but then by the last third, you’re scraping the bottom of the barrel and see you’re finding a lot about things you might find interesting and then you can start trying things. I wanted to try taking a yoga class, it really was not something I’d have done much in my life, and so I put down on my list and I did one last Saturday and it was fine. Not life changing but it doesn’t really need to be. It’s to try things and see what you like and see what you don’t like, and as you figure out what makes you happy and what can work with your life, then you can start planning those things into your schedule and fill in your hours with those sorts of enjoyable things. Peg Fitzpatrick: That’s awesome. Probably when you do, I can imagine 100. I’m going to try it. I haven’t done it yet but I will make my list of 100. My husband and I actually, I did my whole travel wishlist already. Peg Fitzpatrick: Like my lifelong wish list. Laura Vanderkam: You got to come up with some new wishes. Laura Vanderkam: Yeah, and that is not a common problem to have, so another thing to solve, right? Peg Fitzpatrick: That’s a one percenter problem, probably. Laura Vanderkam: Exactly. Very, very first world. I just stopped stressing about it, and I think that’s something that a lot of people need to stop worrying about. It’s like how do you get to the good enough, what is the good enough point? Laura Vanderkam: It’s still different for everyone. Some people really feel like they can’t concentrate if there’s stuff around, which if that’s the case, you just need to own less stuff so you’re not constantly picking it up, but I think a lot of women do have this idea that you’re being judged on the state of your house or more specifically, the idea that you can’t go to bed with things being a mess, right? I joke about this being the 11PM home inspection, like we have this idea that somebody’s going to come inspect our house at 11PM and, I don’t know, you get demerits, but the honest truth is nobody’s coming. Nobody’s going to come look at it. The toys will just come out again the next morning so you won’t get that time back. Use it for something enjoyable. If you have particularly stringent standards and have trouble letting go of this, then this may be an area to perhaps get some outside help and would be a good use of resources to hire some housekeeping help to buy yourself more time. Peg Fitzpatrick: I actually found this thing online. I think she’s still online, I’m not sure. Was this thing called FlyLady? Peg Fitzpatrick: Have you seen FlyLady? Laura Vanderkam: The question is if you feel like you have enough time for the other things in your life and where this becomes more of a problem, especially when you have very little kids and so you have less leisure time as it is and you’re tired, the keeping up with the house work can wind up taking away time from sleep, it can take away the little bit of free time that you do have after they go to bed. In those specific cases, I think it’s worth … Maybe the house is not going to be magazine quality for a few years but they will grow up and then I can make it look better. Peg Fitzpatrick: That’s what I did. It’s worth waiting for. It happens. Laura Vanderkam: It happens, yay. Peg Fitzpatrick: I don’t know how older your oldest is but it does happen eventually. Laura Vanderkam: Yeah, my oldest is 8. Peg Fitzpatrick: My oldest much older than your oldest. My youngest is 18, so I’m right at the other end, which is nice. I was going to segue into nurturing, that women excel at nurturing other people but it’s so hard to nurture ourselves. I will spend all my time doing other things and then my stuff is always last, so can you talk about how self care gets into time management? I would say physical activity is something … Maybe you need quiet time to rejuvenate if it’s reading a book or writing in a journal, maybe it’s getting together with friends occasionally, maybe it’s giving yourself one evening off every week and you just go out and do your own thing, even trade off with your partner if you have one, each of you gets one night, and figuring out what those things are that are pleasurable for you and then making sure that they happen because this is not the martyrdom Olympics. There is no point being miserable. You don’t get any additional glory for having made your life horrible, and yet that seems to be the mindset that a lot of people operate in. Peg Fitzpatrick: It’s true, that is true. It’s hard enough, don’t make it worse on yourself. Peg Fitzpatrick: Can you share a few of your favorite time management strategies that people could try? Laura Vanderkam: One of my favorites, if you do need to work long hours and you have a family you would like to see, a lot of the women in my study did what I call a “Split shift”, so they would leave work at a reasonable hour, let’s just say 5, go home, spend the evening with their families and then do more work after the kids went to bed, and so by putting in another hour, 90 minutes after the kids went to bed, they were able to still work the kind of hours that would lead to these big jobs, these career advancements, and yet they weren’t really trading off family time. They were trading off what would have been TV watching time basically, so that was a trade off they were more willing to make. That’s one of my favorite strategies, it’s to think about how you can move work hours around in order to be more amenable to seeing your family and having down time, seeing if you can trade off low value activities for additional work versus higher value activities for additional work. Another favorite, I’m trying to think what are some of my favorite … I think not being obsessed with email. Peg Fitzpatrick: I’m so guilty of that. Laura Vanderkam: Yeah. Email’s very useful and I like email as much as anyone, I think it’s a great way to reach out to people and explain what you’re doing without difficulty sometimes of doing that the first time face to face, but it’s not like a dishwasher that it has to be emptied in order to be useful, and people have this idea about their inboxes, like “I have to get everything processed, I have to get down to the bottom. It has to be clear.” Why? Why does it have to be processed? People sent you stuff you didn’t care about, why you have to deal with that? You don’t have to deal with that at all, and so I think email is much like housework. It will expand to fill the time you give it, so you can choose to give it less time. It’s not the right approach to say “I’m looking for shortcuts to make me spend less time in my inbox.” What’s going to make you spend less time in your inbox is if you’re doing projects at work that you were so deeply absorbed in that you don’t want to go check your email. It’s the same thing at home if you’re reading awesome books and having fun playing with your kids and pursuing your hobbies and things like that, you’ll naturally spend less time reorganizing the mail pile. Peg Fitzpatrick: That’s great advice. I need to switch back to one of those plans where you only check it so many times a day because otherwise, you’re constantly checking it and it is just like … I actually hate email, greatly hate it. It’s like my least favorite form of communication. Peg Fitzpatrick: You wrote about how making life easier is not about giving up the things that you want to do. Laura Vanderkam: I found some amazing domestic and crafty activities in people’s time logs which was somewhat surprising perhaps that here, these women have these big jobs and also have family responsibilities and yet they’re doing these things that we laugh about, the sort of Martha Stewart-ish type things, whether it’s crocheting or vegetable gardening or making elaborate cakes, there are people doing all these things but it’s because they’re fun. I tell people we’ll make life easier if there’s a good reason you’re doing something, because you love or because it’s a deeply held value, those are good reasons to do something that’s maybe more difficult, more complicated. If it doesn’t fit either of those categories, it’s just because this is the way it’s always been done or this is what people expect of me, then that’s not … You don’t have to make hand made favors for your kid’s birthday parties. You don’t have to do anything for your kid’s birthday parties, just do a call up a bouncy house and that will be fine, the kids would probably love that. If you love doing that, if you love making those little favors, go for it. We can still be in touch with our feminine side or crafty side, creative side and do these things that are sometimes seen as a little bit retro, but if you love them, that’s great. I wanted to be careful with saying … I often tell people to lower their domestic standards, that’s one way to value your self time, but if there’s something you love to do, that deserves a place In your life, whatever it is, and if it something that seems old fashioned or something that women have traditionally done, that’s fine. Peg Fitzpatrick: Those things are all actually coming back in the style again, being a maker and a knitter and a baker. I think Pinterest has researched everybody’s interest and at least pinning the things that they want to make. Laura Vanderkam: It can totally be fun. If you wind up not doing other things that give you more fun because you’re obsessed with getting the perfect bento box lunch combination thing and your kid doesn’t like the food anyway, that’s kind of a waste of time. Laura Vanderkam: A lot good. Peg Fitzpatrick: Is there anything else that you’d like to share that we haven’t covered to give people a better view or a different view of your books, because obviously, they’re going to want to get it. Laura Vanderkam: I hope so. I wanted to counter some of the normal stories in this book. We have a lot of the literature in women and working life is based on these anecdotes and they’ve tend to follow up from certain story, like here we have these stressful things that happened and therefore, I came to this realization that life must change. I must cut back my hours, I must quite whatever it is, and I wanted to show that you can have bad moments within the middle of a good life and that when you look at the whole of people’s 168 hours in a week, there’s often space for all kinds of things and the average woman in my study worked 44 hours a week and she slept 54 hours a week, so you do the math, that leaves 70 hours for other things. That is quite a bit of time. It does not seem surprising that you could have a fulfilling family life, a fulfilling personal life in 70 hours a week, and so people did, but sometimes it’s a matter of moving things around and being creative of when you do things. If family dinner doesn’t work in your house, do family breakfast. If working out in the morning doesn’t work for you, maybe later at night, maybe on the weekends, but probably there is space for whatever you want to do. Peg Fitzpatrick: That’s awesome advice. Again, here is Laura’s book, I Know How She Does It, How Successful Women Make The Most Of Their Time, Laura Vanderkam, she has a website, she’s on social media so you can find her, there’s also links I will put in the video where you can find Laura’s book and buy them. Thank you so much Laura for coming on My Book Club and sharing your book with us. Laura Vanderkam: Thank you so much for having me. I really appreciate it. Peg Fitzpatrick: Have a great rest of your day. Laura Vanderkam: All right, you too. I hope you enjoyed this month’s book club and we’ll be chatting soon to another fantastic author! The links in the post are affiliate links which means I will make a little bit of money from the sale but it doesn’t cost you anything extra. Good information. Thank you for sharing time management ideas.